Detection of bacteria, parasites, chemical contamination in water treatment plants or reservoirs are of great interest for Environment Safety. Detection of virus or bacteria, etc in blood flow is also of great potential in clinical setting. Both application requires a in-line flow mechanism whereby monitoring can be carried out. In these applications, Technospex had collaborated and develop a “flow-Raman” system for use with microfluidic chips and ready for combined used of SERS particles for fast detection. 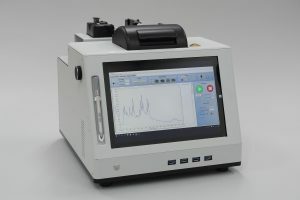 Modification for Fluorescence or other spectroscopy techniques measurement is also possible with minor tweak to the system. The 3rd generation standalone system shown above is completed with touch-screen computer and a motorized syringe pump. Continuous measurement of 150x150x300um volume corresponding to the microfluidic channel of interest was implemented. At 10measurement per second, the liquid sample provided was completely analysed within a minute. An optional inbuilt camera was also implemented to provide ease of identifying the actual measurement region of interest.